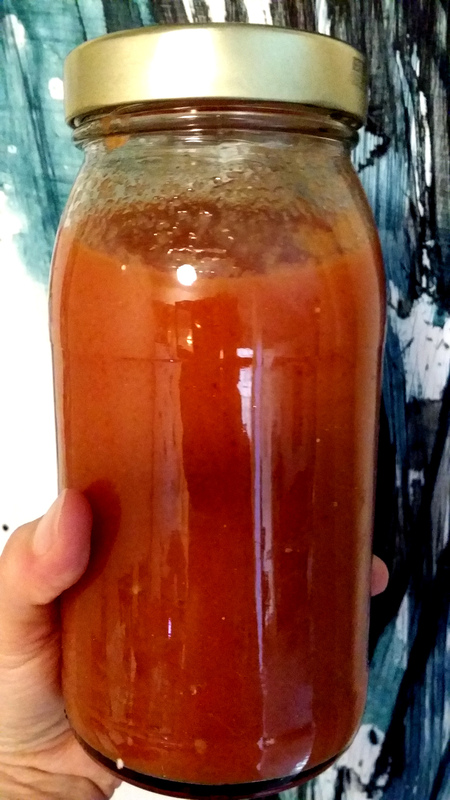 Until now, I’ve mostly done without canned tomatoes and other processed tomato products. So, no ketchup (it’s mostly sugar anyway), cans of tomatoes (cans are usually lined with BPA-infused plastic) or cans of tomato sauce (ditto). I’ve based this on Marcella Hazan’s recipe in her book Essentials of Classic Italian Cooking. 1. 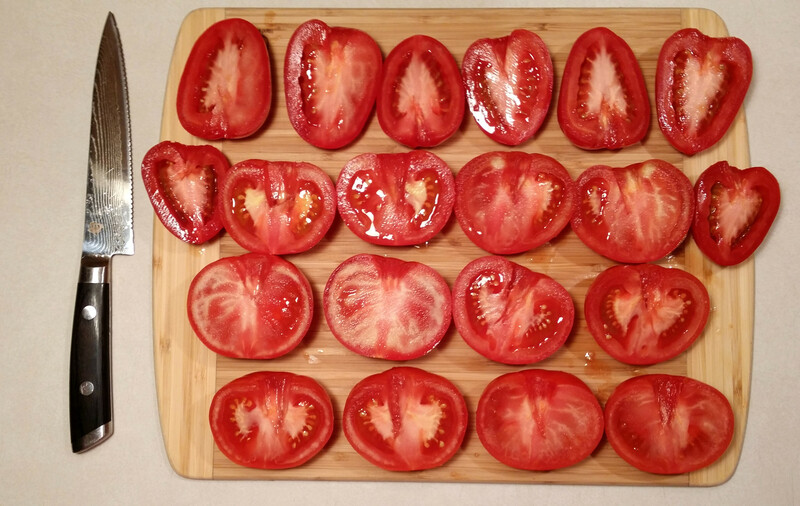 Wash, stem and cut tomatoes in half. 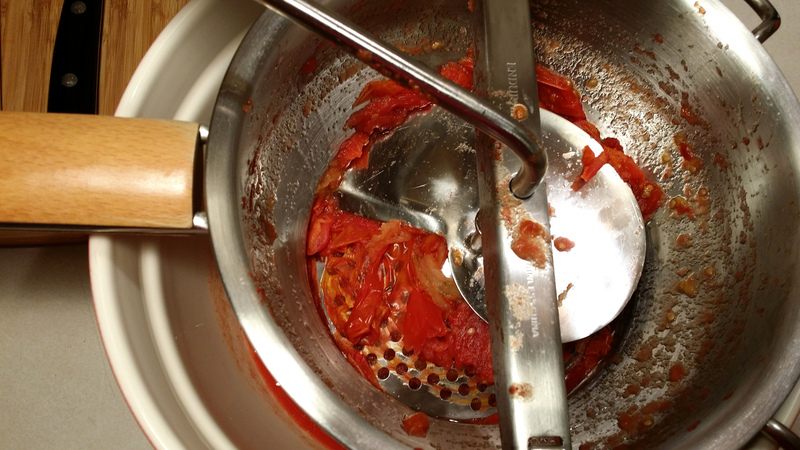 When I wash veggies, I immerse them in a stainless steel bowl filled with water. (If I have other veggies or fruit to wash, I toss these in next.) This cuts down on water consumption and I water my Bougainvillea outside when I finish cooking. 2. 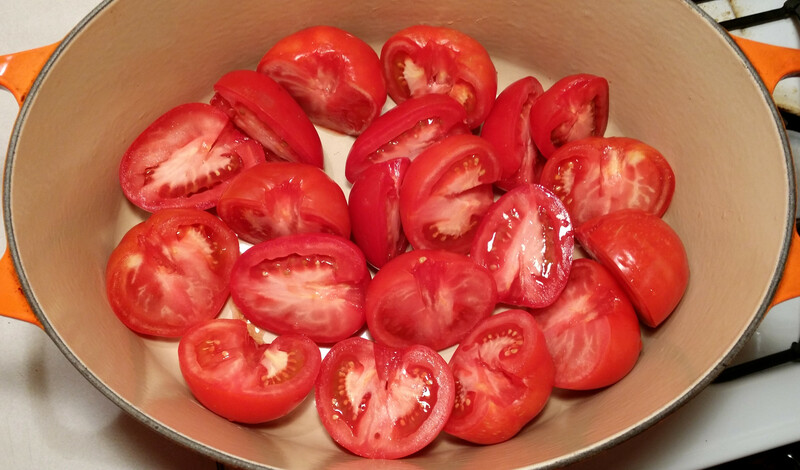 Place tomatoes in a pot, cover with a tight-fitting lid and cook on medium-high for 10 minutes. I used my le Creuset Dutch oven for this batch. (I love love love my le Creuset pots. I told my coworkers I want to be buried in a le Creuset coffin, but they pointed out that no one would be able to lift it.) For another batch, I used a stainless steel sauce pan. Both pots worked equally well. 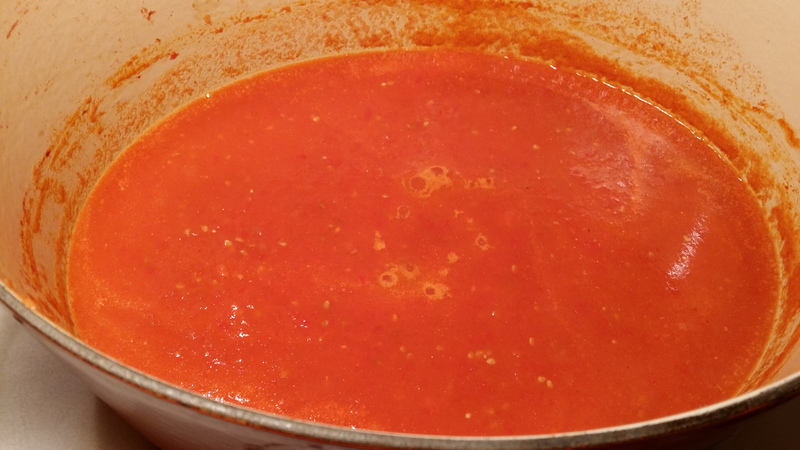 The tomatoes will be slightly mushy (but not complete mush) and the pot will contain some liquid. 3. Attach the disk with the largest holes to the food mill. 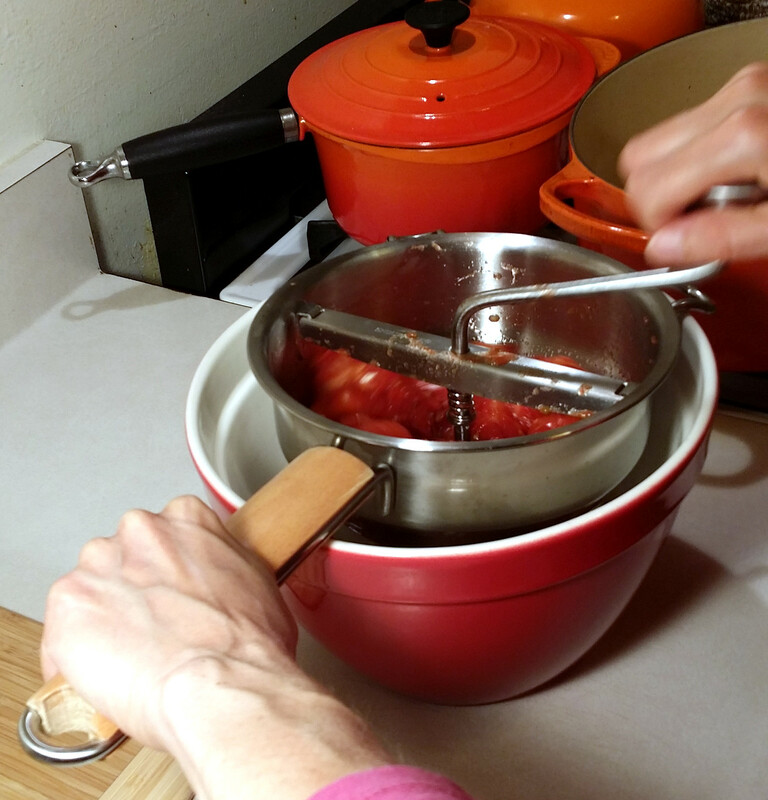 Transfer the tomatoes and their juice to the food mill set over a large bowl. 4. 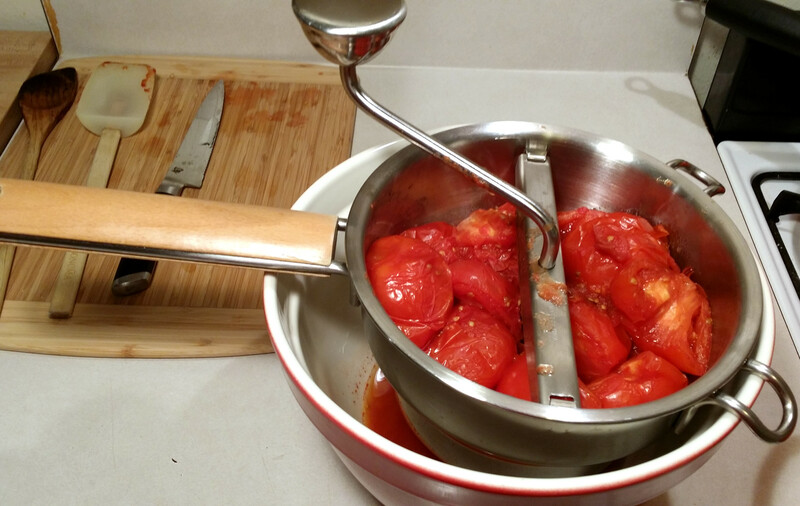 Crank the food mill until you have just tomato skins left. This takes only a few minutes. 5. 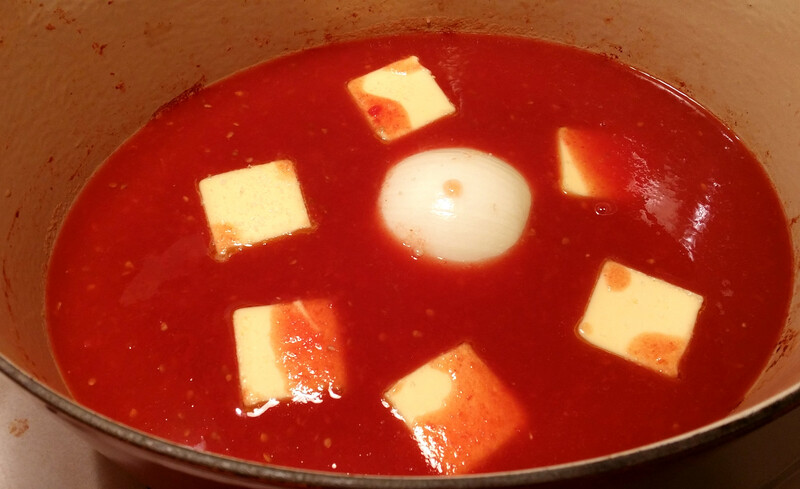 Add processed tomatoes back to the pot, along with the butter (or olive oil), half an onion and salt. Simmer slowly for 45 minutes, stirring once in a while. When I made a second batch of this with olive oil, I was busy Skyping with my mum in Canada, and I rarely got up from my chair to stir my sauce. She says she can’t talk unless she can see me. I asked her how she used to talk on a telephone. 6. Remove onion and voila! 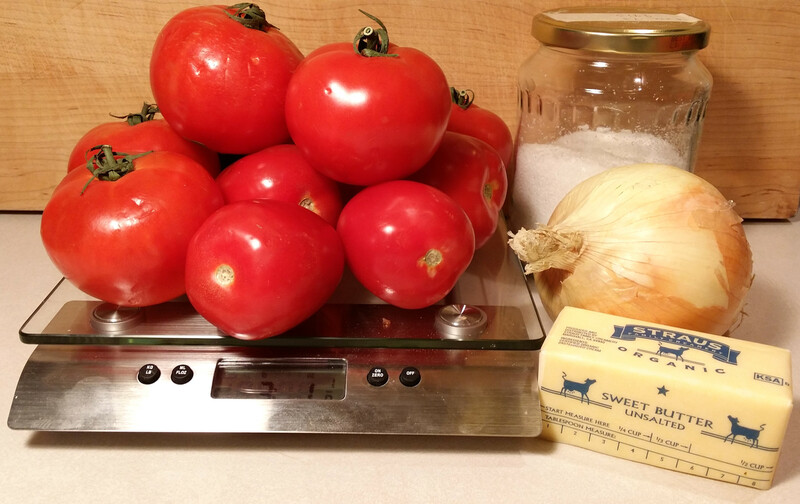 You now have homemade tomato sauce to use in your favorite recipes. Or freeze or refrigerate it for later. It should keep in the fridge for about a week. If you freeze it in a glass jar, use a wide mouth one and make sure to leave an inch or two at the top of the jar so it doesn’t explode as it freezes and expands (I speak from experience). 7. Save the onion for another dish. Add it to soup, quiche or frittata, pizza sauce, pan-fried potatoes, roasted vegetables…the possibilities are endless! The jar above comes from the second batch with olive oil. 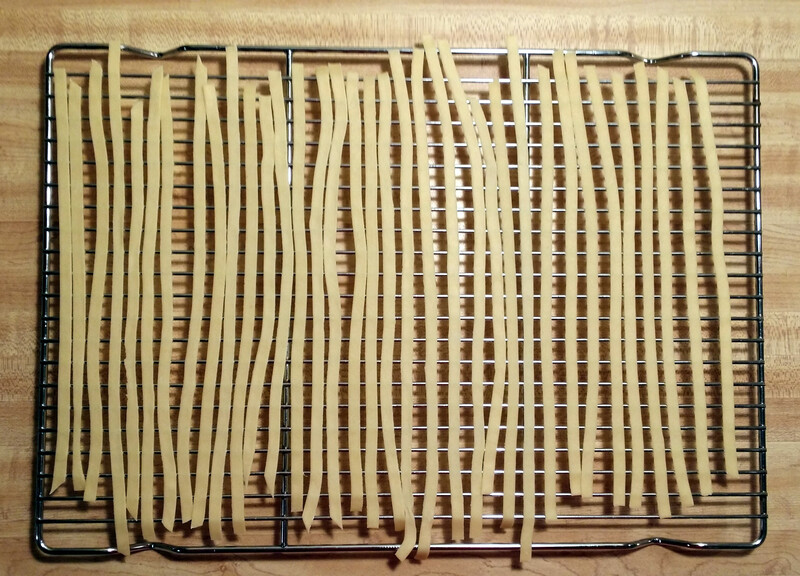 My daughter MK made pasta from scratch while the tomato sauce cooked. 1. 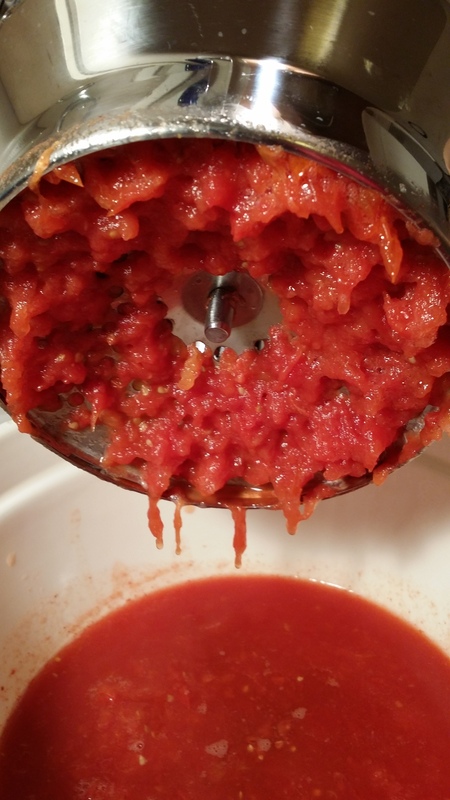 Wash, stem and cut tomatoes in half. 5. 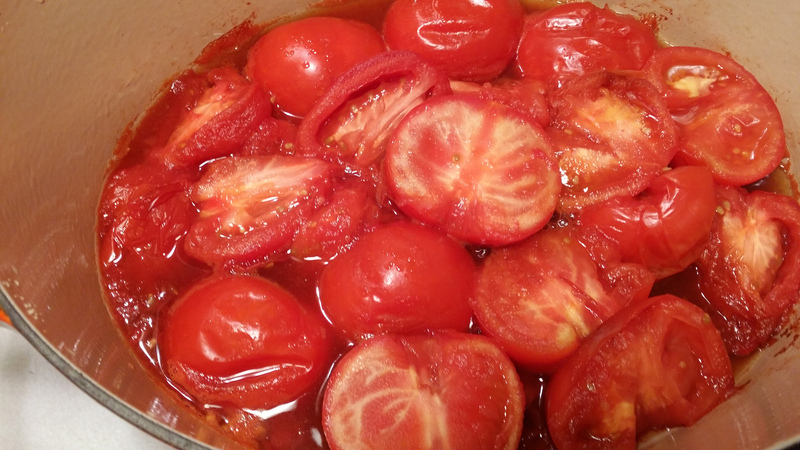 Add processed tomatoes back to the pot, along with the butter (or olive oil), half an onion and salt. Simmer slowly for 45 minutes, stirring occasionally. 6. Remove onion and use sauce in your favorite recipe or freeze or refrigerate it for later. It should keep in the fridge for about a week. If you freeze it in a glass jar, use a wide mouth one and make sure to leave an inch or two at the top of the jar so it doesn’t explode as it freezes and expands. I need to plant tomatoes [and learn how NOT to kill them!] and do this. I’m impressed! And finally I get to see how to properly use a food mill! PS, with that shampoo recipe, do you dilute the apple cider vinegar first? It does seem a bit strong or are you just careful to keep it out of your eyes? I have recently read some things about using this & thought you might be a good person to ask, too! Thanks in advance! Thank you! The food mill is very easy to use. As for the “shampoo,” I dilute the baking soda and the cider vinegar (and yes, be careful not to get it in your eyes–I have and it stings a bit). First, I add about a tablespoon of baking soda to a jar, fill it with about 1/4 to 1/2 cup of water, pour that on my hair and scrub my scalp, run my fingers through my hair and then rinse. I then add just a small amount of cider vinegar to the jar, maybe a teaspoon or less, add 1/4 to 1/2 cup of water, pour that on my head and run my fingers through. I stick my head under the shower head for a millisecond after that (not sure if it’s necessary, but it has been working). My older daughter didn’t like this method, but it works so well for me. It costs next to nothing, I have no plastic bottles to dispose of and it makes me just a tiny bit more self reliant…That was a pretty long answer to your question. Let me know if you try it and like it! Home made sauce is the best! I have about 24 tomato plants in my garden and can’t wait to make sauce and can it. Enjoying your blog! I’m blessed to have two fairly large gardens. Thanks for checking out my blog as well. I look forward to sharing lots and learning lots! Thank you. I put this into Google translate. Now I know a German word 🙂 My Flotte Lotte works really well. I use all types of jars but stick to wide-mouth ones. I broke a glass bottle once in the freezer by filling it too high with liquid (broth probably). The liquid froze, expanded and broke the bottle cleanly at the top. It was a really nice bottle 🙁 It’s the type of mistake you make only once. Now I stick to wide-mouth for everything. I also prefer wide-mouth because I can reach my hand in to clean them easily. They really are. I have a bottle brush but I still hate cleaning the narrow-neck ones. They tend to linger in the sink for a while until I finally have no choice but to wash them. Hi Christine. That’s not daft at all 🙂 Our food mill belongs to my daughter and I’m sure she’ll reclaim it one of these days. If you don’t have a food mill, in an ideal world, you could first blanch and peel the tomatoes and then remove the seeds. Then I would make the sauce and puree it in a blender. You could skip the peeling and seed removal but I think the sauce would turn out better if you at least peeled the tomatoes. Are you cooking the tomatoes in water, or is the liquid shown in the cooking pot photo just from the tomatoes themselves? If you did add water for the cooking, how much? I’ve never tried this before and don’t want to burn them by doing it wrong. Thanks. Why do you remove the onion bevore freezing the sauce ? You could cut the onion in small pieces en freeze it with the sauce?